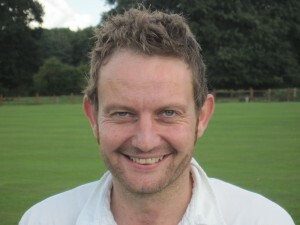 The man formerly known as ‘Shaggy’ but now frequently referred to as ‘Shafty’ was first team skipper for 5 seasons, leading us to two Norfolk League Division 1 3rd place finishes before spearheading the club’s move to the Norfolk Cricket Alliance. He was once a painter-and-decorator and we still like the old joke about him putting more runs on the door of the changing room than on the scoreboard! In actual fact, he still features in the club’s record partnership of 244 and has scored 3634 runs, including 5 half-centuries and a highest score of 75. His batting opportunities were limited during 13 years in the First Team but for the last 5 seasons, he has weighed in with some valuable runs for the A Team. Still an excellent wicketkeeper, the familiar cry of ‘Shafty’s under it!’ is frequently heard as he snaffles another victim – 395 (302 caught, 93 stumped) in 514 appearances since 1992. In a former life he worked behind a computer screen at Aviva and it was Shafty who set up and managed the club’s website until Martin Cook took over. He has been a regular ‘tourist’, able to consume vast quantities of beer with no apparent effect. Now he and, wife, Alex have two boys, you would expect him to have to rein himself in a little but that wouldn’t suit his ‘rock star’ image. He is an accomplished lead guitarist as those of us who have sampled ‘The Cream Horns’ at our Presentation Dinners or Beer Festival will testify. Six years ago Simon obtained his ECB Level 2 Coaching Qualification and spent a season coaching ‘the Fundamentals’. We suspect he U9s may have put him off coaching for life although he used the excuse that a job move to Diss meant it was difficult for him to get to Melton Park by 6.30. However, we do hope to have him back coaching at the club once Robbie is old enough to enrol as a junior member – Robbie certainly knows his way around the kit store already! An excellent clubman, 7th in Melton’s all-time appearance list, Shafty, for some unknown reason, thrust himself into the captaincy limelight again last season, taking the reins of the A Team. He must have wondered why at times as a season of struggle culminated in relegation but, ever the glutton for punishment, he has decided to remain at the helm in 2017.